The way marketers engage customers is changing rapidly, yet most companies haven’t evolved the organizational structure of the marketing function in the past 40 years. Marketers know their organizations need an overhaul, but what if the answers aren’t in a new blueprint? 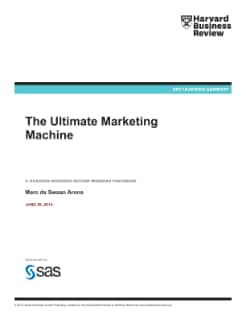 Now in The Ultimate Marketing Machine, a report based on the Harvard Business Review webinar, you can read the extensive new research on what it takes to become a superior marketing organization. Drawing on a multiyear study involving more than 10,000 marketers from 92 countries, EffectiveBrands principals Marc de Swaan Arons and Frank van den Driest provide a framework for building a high-performance marketing organization.